The State Governments of Haryana, Punjab, Himachal Pradesh, Odisha, Kamataka, Madhya Pradesh, Rajasthan, Goa & Sikkim shall utilize the results of AIPGMEE 2015 for admission to MD/MS/ PG Diploma courses at colleges under their control. These states shall not be conducting any state entrance examination of their own. Approval from other State Governments is awaited. Admission to MD/MS/ PG Diploma courses at institutes under Armed Forces Medical Services, University of Delhi and RIMS lmphal shall also be made on the basis of results of AIPGMEE 201 5. 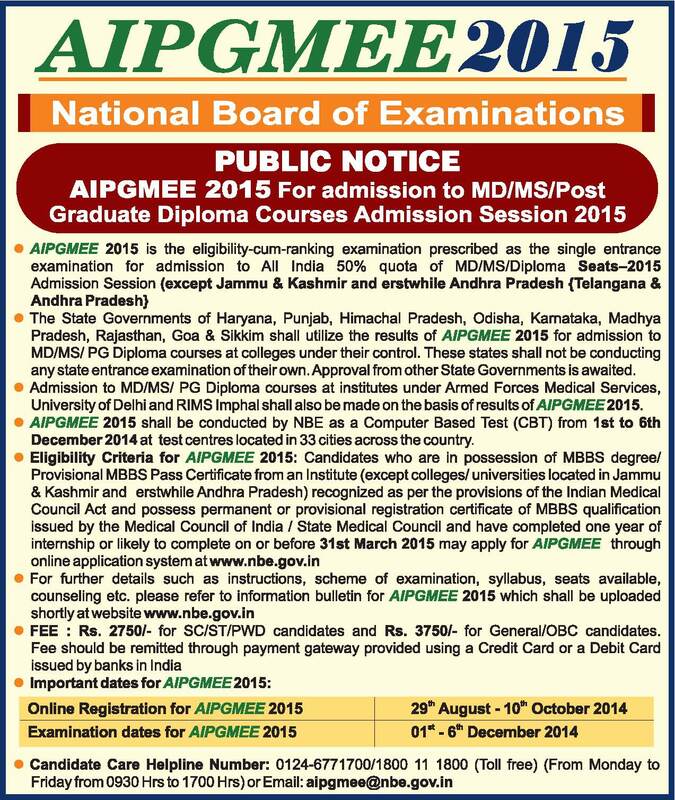 AIPGMEE 2015 shall be conducted by NBE as a Computer Based Test (CBT) from 1st to 6th December 2014 at test centres located in 33 cities across the country. FEE : Rs. 275o/– for SC/ST/PWD candidates and Rs. 375o/– for General/OBC candidates.